INDUSTRIALS, ENERGY SET TO RESUME HIGHER – PRECIOUS METALS TO SOAR! The grand ‘RE-SYNCHRONISATION’ process of 2016 produced a realignment of major asset classes following divergences over the preceding years from the 2011 peaks. Developed and Emerging market indices synchronised in January/February 2016 by ending major corrections into the lows, then resuming secular-bull uptrend thereafter. But it wasn’t just stock markets that underwent this recycling. Commodities also formed major corrective lows into the exact same time zone which was the reason behind such huge percentage gains that were recorded into the first half of last year. The grand re-synchronisation was probably the most important even of last year but it was largely unrecognised by the financial community. Mainly, because asset managers are mostly specialising in individual asset classes rather than taking a macro-holistic approach to investment. Not only that, but when these different asset classes are lined-up together with the help of viewing them through the lens of the Elliott Wave Principle, suddenly we see a glimpse into the future. That realisation is very profound because ‘seeing’ into the future price development of markets can be, is a humbling experience. I’ve witnessed this so many times during my 40-years in trading and yet each new glimpse is as special as all those of the past. What makes the ‘RE-SYNCHRONISATION’ process special is the way it aligns disparate Elliott Wave pattern development into an alignment of ‘POSITIVE-CORRELATION’. When stock markets peaked in 2007/08, so did commodity markets and when prices collapsed during the 2008/09 financial-crisis, both asset classes formed major lows within just a few months of each other. The recovery phase also saw both trend higher afterwards and that’s where the great puzzle begins. Whilst U.S. stock markets began new secular-bull 5-wave impulse uptrends, many commodity markets began the same advance but as 3-wave zig zags, or in some cases double zig zags. And these zig zags are simply the second sequence within even larger, multi-decennial expanding flat patterns – yes it all gets a little complicated. But herein lies the hidden path that future price development is taking. It’s no wonder that during 2011-2016, commodity prices declined rapidly whilst U.S. stock markets trended higher because it was a necessary function in order to allow the 5-wave development of one to play out whilst allowing a 3-wave pattern unfold in the other. In fact, the commodity correction in 2011-2016 realised wave ‘B’ within the zig zag upswing unfolding from the financial-crisis lows whilst the 3rd wave uptrend continued in stocks. The resynchronisation occurred when wave ‘B’ ended last January/February at the same time a minor fourth wave correction completed in stocks. From an Elliott Wave pattern perspective, they were now realigned in positive-correlation and can both head higher in the next major phase of their respective patterns. But what of 2017? So far, this year has delivered different performances following last year’s impressive commodity gains. Base Metals have undergone counter-trend retracements as has the Energy sector. These are seen co-existing in a shorter-term positive-correlation environment which is largely dependent on how supply imbalances are being worked off. Precious metals ended their corrective declines earlier, last December (2016) and are already resuming larger uptrends established from last year’s lows as geopolitical events have a positive impact. Just recently however, the Base Metals and Energy sectors have or are approaching the end of these shorter-term corrective phases that began from last year’s peaks. This is happening at the same time that Precious Metals are building a strong platform of support in preparation for the next stage of accelerative advances. From this we can determine that all three commodity sectors are poised to surge higher for the remainder of 2017! This MID-YEAR 2017 COMMODITIES video takes a look at how these shorter-term realignments fit together across Base Metals, Precious Metals and the Energy complex for Crude and Brent Oil. We show how the ‘RE-SYNCHRONISATION’ process of 2016 dovetails with ‘POSITIVE-CORRELATION’ studies, how these interact and combine to reveal this next stage of major price advances into the second-half of this year, 2017. How can you order the new COMMODITIES video forecast? And if you’d like to subscribe to the STOCK INDICES video PART I and up-coming CURRENCIES videos PART III, you can receive ALL THREE for $96.00! – that’s a saving of 33% per cent! 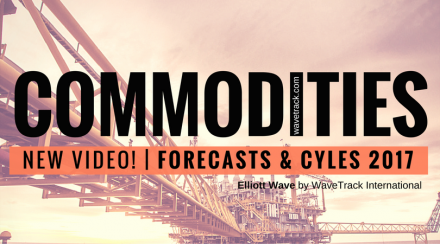 Each video runs for at least 1 hour 20 minutes and it’s packed with SPECIFIC Elliott Wave price-forecasts (the COMMODITIES Video is already 1 hour 30 mins. long!).. BONUS! Each of the 52+ charts illustrated in the VIDEOS will be created into a .pdf document/report and sent to you so that you can always keep these to refer to! PART III for Currencies and Interest Rates will be available in a few weeks’ time (June/July 2017!) – we’re working on it! – Please state if you wish to purchase the SINGLE VIDEO for COMMODITIES for USD 48.00? Havn’t got a a PayPal account? We accept all major credit cards – just tell us your preferred payment method in your email and we’ll send you instructions.